The Sherwood School Board has formally asked the city to withdraw its request, citing concerns over the growth it would bring to the schools. The city staff formally recommended, in a staff report, that the council withdraw its request to expand the UGB. Members of the Planning Commission have asked that we withdraw our request. An informal poll of the residents of Sherwood showed overwhelming support to withdraw the request. We currently don’t have the transportation infrastructure in place to increase our population by 50% and the commuter load that would put on our roads. We need to complete a community visioning process, the comprehensive plan and do more work to engage the community, prior to asking to expand the UGB. 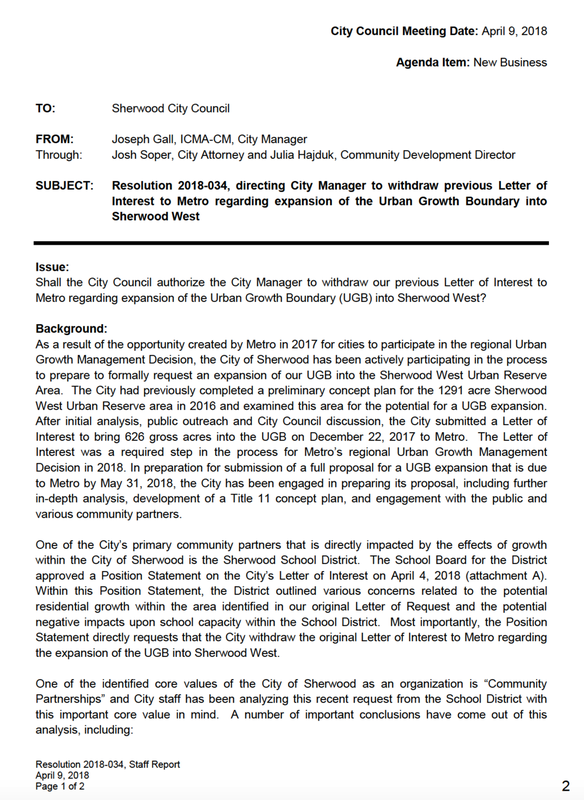 On April 9th 2018, the city council considered a resolution asking the city manager to withdraw our request to expand the urban growth boundary, council did not make a decision in that meeting. We will be deciding the fate of this resolution in the next council meeting on the 17th of April, 2018. Powerful special interest groups, that are not aligned with the desires of the community, are working hard to push the expansion of the UGB. During public comment on April 9th, the majority of groups we heard from were large land development companies, land buyers, the Home Builders Association, and even an elected official from outside our city. All were in favor of the UGB expansion. Assuming a growth rate, consistent with historic growth rates in good economic times, school capacity will be exceeded by 2025. An expansion of Sherwood West will generate additional revenue through property taxes for the city, however residential areas are the most expensive to provide services to like public safety and library services. On average, for every dollar you bring in in revenue, it costs the city $1.25 to provide services. Over time, we will quickly find ourselves in a pinch to raise taxes to cover the General Fund. LOI: 1.1M net Loss to general fund. Revised Request: 953K net loss to general fund. Community Visioning, What is that?